Though known as the Dutch Palace, it was actually built by the Portuguese. The Dutch only made modifications to it. 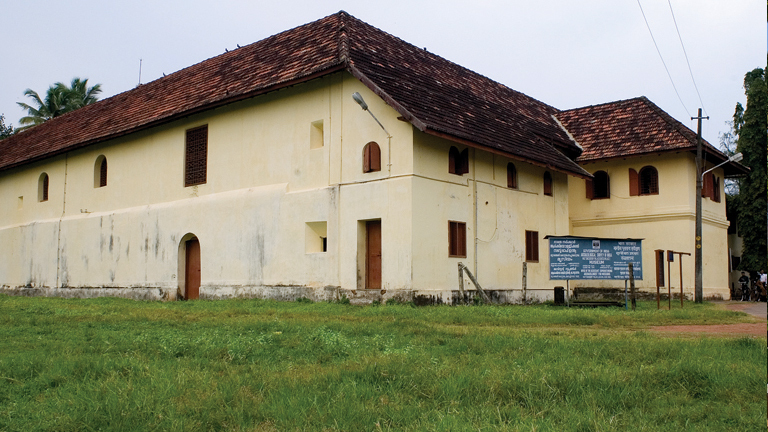 The Portuguese who looted and plundered most of the region at the beginning of the 16th century, in a bid to establish commercial ties with the royal dynasty, built a palace and gifted it to the King Veera Kerala Varma. Though the Dutch made improvements to it, like the Portuguese, they too did not stay in it. This later became the official residence of the Kochi dynasty. Important functions of the Kochi dynasty were held in the Dutch Palace. The Palace is a quadrangular structure built in Naalukettu style, the traditional Kerala style of architecture. In the middle of the courtyard stands a shrine dedicated to Pazhayannur Bhagavathi, the Goddess of the Kochi royal family. And on the either side of the palace are a Siva temple and a Vishnu temple. The floor of the palace is made of a mix of egg whites, plant juices, lime, burnt coconut shells, charcoal giving it the look of polished black marble. Visitors can see mural paintings, portraits, instruments, weapons, statues and so on in the palace.